Looking for a high quality creeper for the colder months to offer your customers? Look no further! Finished sleeves, three-snap bottom closures that match the color of the garment, 6.1 ounce interlock, ring-spun, combed cotton ensures that your clients are purchasing the highest quality for a great value! Our material is perfect for designing, whether your business embroiders, screen prints, or otherwise embellishes on on products. Your clients will love the quality of our long sleeve Wee Wearz creepers! Q: Do you know when you will get the newborn/0-3 month long sleeve white creepers back in stock? A: We are hoping to get the shipment around the end of october. 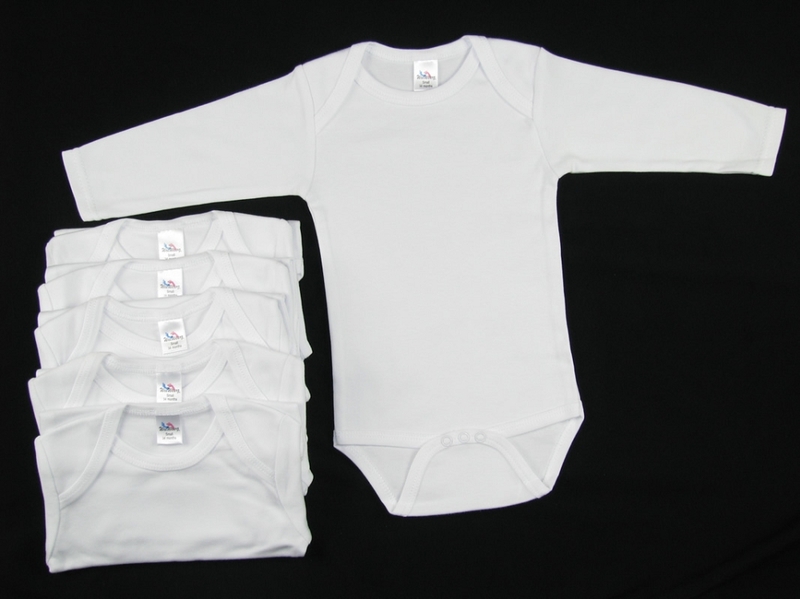 Q: I am in need of white long sleeve size 3-6 months and they have been out of stock on your site for a while. Any idea when you'll have them back in stock? Thanks! A: We do have them available. I'm not sure why they were saying out of stock. Stock is updated! Q: The photo shows 5 pieces. Is this item a 5 pack @ 1-5 packs for $6.60 each or 1 piece @ 1-5 piece for $6.60 each? A: These sold by the single garment. Also, the bulk pricing is per garments. So, if you were to purchase 6 of these creepers then you would receive the second column pricing (you can mix and match colors/sizes to get the best price).